On 27 March 1914, Belgian doctor Albert Hustin conducted the first non-direct transfusion, using sodium citrate as an anticoagulant. Initially, blood transfusions needed to be made directly from the donor to the receiver before coagulation occurred. However, in the 1910s, it was discovered that adding anticoagulant to blood and refrigerating it allowed for longer storage times, which led to the establishment of blood banks. 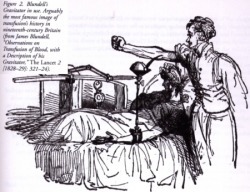 Dr. James Blundell, a British obstetrician, performed the first successful human blood transfusion of human blood in 1818, which was used to treat a postpartum haemorrhage. The patient's husband was the donor, and gave four ounces of blood from his arm to his wife. From 1825 to 1830, Blundell conducted 10 blood transfusions, of which five were successful. Blundell went on to publish his results and invent several instruments to use in blood transfusions.